Impressive Journeys For Gee Scott Sr. & Gee Scott Jr. When Pete Carroll arrived in Seattle as the new head coach for the Seahawks in 2010, his first mission was to change the culture of the franchise. He clearly accomplished that goal, turning the team around and leading them to a Super Bowl in his fourth season, but the impact went far beyond wins and losses. “I’ve got to be honest, that mentality he brought didn’t just resonate with the players,” Gee Scott Sr. explains. “It resonated with the coaches. It resonated with the upstairs. Scott Sr. knows because he was that guy cleaning cars out there in the parking lot. “That guy got that feeling of winning forever and always competing,” he said, referring to himself. For 11 years, Scott Sr. cleaned those cars until his life took a different path. “Long story short, being around the Pete Carroll regime and that Super Bowl champion team changed my mentality,” Scott Sr. says. “It changed the way I would think. I just always felt like I wanted more. 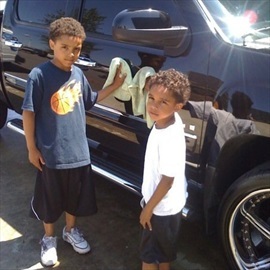 Gee Scott Jr. and his brother, Zion, helping their dad wash cars. Scott Sr. saw those young players compete to see who could get to the facility the earliest while displaying a consistency that bordered on extreme like Wilson parking in the exact same parking spot every single day. So, he instituted an early-morning routine into his own life, something he keeps up to this day. Early for Scott Sr is 5:30 a.m.
“I go drink a glass of water and apple cider vinegar,” he says. “That is my morning routine. I get up and I get going. The goal is, I can’t lay back down. Whatever it is, I’m up and at them. Now, it involves a two to three-mile run every single day. It didn’t start off with a two to three-mile run. Just waking up early and going right to the fridge and getting some water and apple cider vinegar, that consistency right there started me off. And eventually, Scott was presented with a chance that would change his life when he was offered a radio spot on ESPN710 Seattle. “I lucked up,” he says. “You can call it luck, you can call it preparation meeting opportunity. Call it whatever you want to, but I had an opportunity to do radio and I grabbed onto it. And since it worked so well for him, he figured it would work well for his son, Gee Scott, Jr., who was struggling in school at the time. “I thought, if my morning can be better by getting up and doing a routine, then his morning needs to be better by doing a routine,” Scott Sr. says. “I had him get workouts early in the morning, at six in the morning, so he could be better at school. Gee Scott Jr. with one of his early workouts. And his father also made sure he was held accountable. “He was getting in trouble with his teachers all of the time, always getting in trouble,” Scott Sr. says. “He had to get signed off from his teachers that he had had a good week. If he had a good week then he gets to play video games and gets his privileges for the weekend. If he does not have that signed-off sheet by his teacher, he gets no privileges and no video games. Scott Jr. never complained once, according to his father. These days, Scott Jr. has a reputation as a mature, well-spoken young man, something his father says would surprise authority figures who knew him when he was younger. But Scott Sr. knew it could be done because he did it himself. As it was with his father, basketball was Scott Jr.’s first love. His father played college basketball at Tri-State University – now Trine University – in Angola, Ind. “The one thing I kept in the back of my mind was that I always believed that I picked the wrong sport,” he says. “I only got to 6-1. But at the time, basketball did provide one of those goal for Scott Jr. to shoot for, making the AAU Seattle power Rotary squad. “It was a goal for him to make that, so he really worked hard so he could make the sixth-grade AAU team,” Scott Sr. says. “He worked his tail off and he made the team. But, just as his father guessed, football eventually emerged. His father was initially reluctant when Scott Jr. asked to play as an eighth-grader. At the time, the family lived in an apartment near French Field and on Friday nights, Gee and his younger brother Zion, would head over to check out the football games. Scott Jr. would tell his father about his hands and urge him to come watch. Eventually, Scott Sr. let his son play organized football. While he didn’t immediately see the potential, it didn’t take all that long before he did. 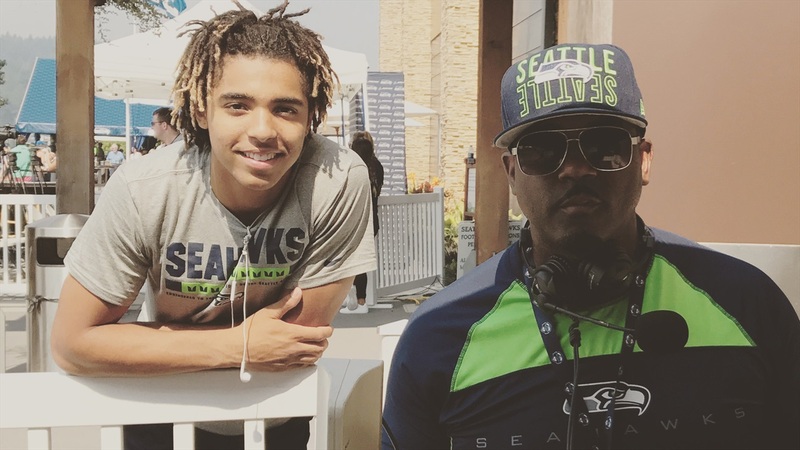 Scott Jr. used his father’s connections with the Seahawks to form his own connections with players. He became very close with Golden Tate during the former Irish star’s time in Seattle, but that was before Scott Jr. was serious about football and was more about playing video games than playing football. As he started to take football more seriously, he’s had the opportunity to train with and learn from guys like Doug Baldwin and Sidney Rice. “One thing about him, he asks a lot of questions,” his father says. “He’s not one of those kids who thinks he knows it all. He’ll ask questions all of the time. He picks the brains of those guys. 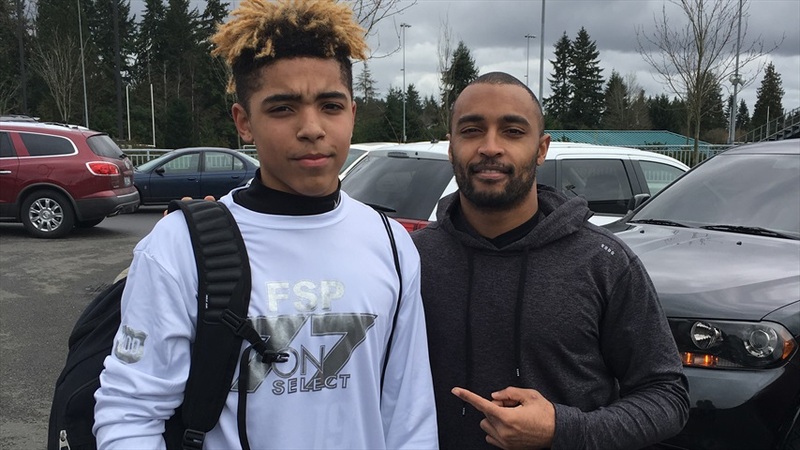 By the time Scott Jr. completed his freshman season at Eastside Catholic, he had already cemented himself as “The Next Big Thing” at receiver in the state of Washington. And while the program has helped Scott Jr. continue to emerge as one of the most talented prospects in the entire Class of 2020, his father looks at how the school has helped his son grow off the field. “I do have to give credit to his school, Eastside Catholic,” Scott Sr. says. 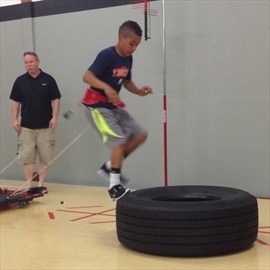 “That school and that environment is really helping the methods that he’s getting at home. At the end of the day, as parents you can’t do it all. It takes a village. What they’re doing over at Eastside Catholic complements what I’m doing here in the household very well. While Scott Jr. is still in the beginning of his journey as a player and a person, he’s already earned an extraordinary amount of respect from his father. “Words can’t explain how proud of him I am. I think what he has done has already surpassed any of my expectations. I think what he continues to do amazes me every single day. It’s not what he does on the football field. You know what, he’s great. On the football field, he’s big, he’s strong, he’s fast, he’s a technician at his position. It’s the decisions that he makes off the field what continues to impress me. “I’ve been around an NFL franchise for 15 years. I’ve seen what works, I’ve seen what doesn’t work. I’ve seen some of the most talented players not make it in the NFL because of the problems off the field.